When Erin Sorensen and her husband moved into the Veterans Park neighborhood of Boise, Idaho, it was so “rough” he wondered why she was insistent it was a good choice. A few homes were clearly a hive of drug-related activity, police came in and out, fences were vandalized with spray paint and the school bus was a shooting target. Erin’s first major project was the conversion of a vacant lot near her home into a community garden. Looking to recruit participants, she went door to door through the NeighborWorks’ apartments across the street. A little more than 10 years later, Erin is (among many accomplishments) the former board president for the Veterans Park Neighborhood Assn. (and current member), chair of the NeighborWorks Boise board real estate committee and a member of the local chamber’s Leadership Boise initiative. Veterans Park has improved so much that the current challenge is to avoid the negative effects of gentrification, thus pricing her family and others out of their beloved neighborhood. How did such a change happen? Sorensen is widely recognized as one of the reasons. 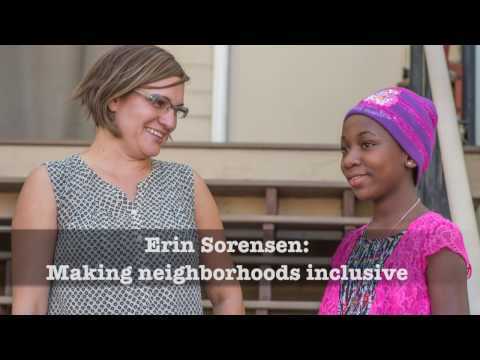 Sorensen’s first major project was the conversion of a vacant lot near her home into a community garden. The initiative was a collaboration with Global Gardens, a program of the Idaho Office for Refugees that focuses on healthy lifestyles and entrepreneurial training through the cultivation, harvest, cooking, eating and sales of fresh produce. Looking to recruit the first participants in the garden, Erin and two other women went door to door through the NeighborWorks’ apartments across the street, home to many migrants and refugees from countries such as Somalia and Nepal. That was in 2009. Today, 15 families are working plots in the Jordan Street Garden, along with a group of mostly mothers and children who cultivate a common plot. Tuesday nights in the garden have become a social event in the community. In addition, about 10 more families are developing a private lot along with another nonprofit called Deep Roots Boise, formed by a local resident to support communities and land owners as they convert empty plots into community gardens. Sorensen didn’t stop there, however. Wondering why her neighborhood was such a target for petty crime, Sorensen began noticing the groups of mostly 12- to 14-year-old boys hanging around on the street corners, and got to know most of them by name. Then Sorensen learned about the community room at the Davis Park Apartments, the same NeighborWorks property she had canvassed for the garden. The Boise Parks and Recreation Department had had to cut its after-school and summer program there, and it was available. She seized the opportunity. The first step was simply to open the room for a few hours each Saturday and turn on the facility’s four computers—with Erin as the “facilitator.” From there, the activity expanded to include interactive games and toys to help younger children develop fine motor skills. Once NeighborWorks’ AmeriCorps Vista workers joined in and secured some grant funding, a formal Explorer program was added to build youths’ STEM (science, technology, engineering and math) skills. Sorensen brought that same instinct for “drawing people in” to her work on a team charged with developing the 30th Street master plan. Her focus was an infusion of the area with a celebration of culture, resulting in the identification of 16 opportunities for public art—of which three have been realized to date. Today, Sorensen is spending most of her time working with NeighborWorks Boise on the challenges of preserving affordable housing. “Land values are skyrocketing and I don’t want teachers, firefighters [like her husband] and other working-class residents to be priced out of our own neighborhood. I want to make sure it continues to offer a place for us to call home.